Mahindra has added another feature to the Marazzo’s kitty. The top-spec M8 variant of the people mover now offers Apple CarPlay connectivity along with Android Auto. If you already own a Marazzo M8, fret not. You can head to the nearest service centre and get the feature for your car via a software update. Needless to mention, this update is offered completely free of cost. Notably, this update does not apply to the touchscreen in the M6 variant. The prices of Marazzo diesel variants start at Rs. 10.18 lakh and the top-end diesel is priced at Rs. 14.59 lakh. Mahindra Marazzo is available in 8 variants and 6 colours. The claimed ARAI mileage for the Mahindra Marazzo diesel is 17 kmpl. The Mahindra Marazzo has carved out a nice niche for itself, right between the Maruti Suzuki Ertiga and the Toyota Innova Crysta. It’s a pukka 7- /8-seater and has all the goodies a modern family would require. Sure, it isn’t a driver’s delight, but that’s hardly something that’s expected from an MPV anyway! Q. 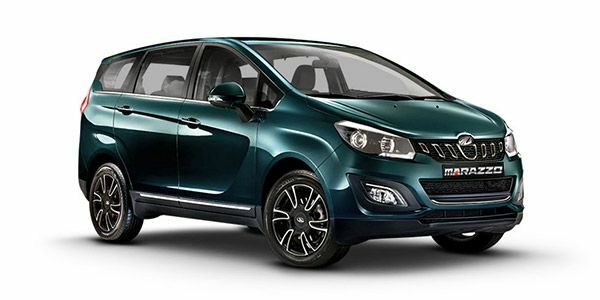 Which is best Marazzo, Ertiga or Breeza? Q. Which is better Harrier or Marazzo? What....how can u compare 10lac MUV with 19lac SUV....kuch bhi....? Q. What is the Ground clearance? It has not been revealed by the brand yet. I have measured it with a scale. It is 200 mm at the centre of front bumper (unloaded) . Q. Can Marazzo climb temple mountains easily with 8 persons in the car? With a full load it can easily get the job done highways, however, you'll feel a lack in power while climbing hilly roads with a full load. Q. Is it have Electronic Stability Program and can I get a list of Indian Cars fitted with Stability Program and Hill Assist control? The Marazzo is unlike any Mahindra from the recent past. It’s a genuine breath of fresh air in the way it looks, drives and feels on the inside. Taking on stalwarts like the Ertiga on one hand and the Innova Crysta on the other is no small task but the Marazzo manages to find a nice sweet spot right in the middle. Yes, we think it could be priced a bit more aggressively and could’ve had petrol and automatic options from the world go. But Mahindra has promised us that’s coming by next year, so we’re willing to let it pass for now. Inspired by a shark, they say. Do you see the resemblance? We do, even if faintly so. That said, there’s no denying that the Marazzo is a handsome MPV. And we’re glad Mahindra designers haven’t gone overboard in adding unnecessary styling elements to it. The smoked out headlamps work together with the toothy grille to give it a confident face. From the side, the large 17-inch alloy wheels stands out and so does the subtle sliver of chrome that underlines the massive glass area. It’s slightly quirky from the rear but the large shark fin-inspired tail lamps do well to provide some relief to the eyes. With the Marazzo, you get the sense that function was valued over form. Glad! Because, it clearly shows on the inside. The Marazzo’s wheelbase is longer than that of the Innova Crysta’s. And that’s despite the Mahindra being a full 150mm smaller. Entering and exiting the MPV is a breeze, and there’s a healthy amount of room no matter which row you’re seated in. It’s among the few cars in which you can travel with seven or eight occupants without jostling for room. On the features front, there’s what you’d expect — a touchscreen infotainment system, automatic climate control, cruise control, a 4.2-inch display in the instrument cluster, and leather seats. There’s a unique roof-mounted air-conditioning system as well, which we must say works without a hiccup. Issues include that there’s just one 12V socket in the whole car, and one USB slot for the second row to charge phones. You also don’t get the feel-good features such as auto headlamps, auto wipers or an auto-dimming IRVM. Also, we think the Marazzo could’ve done with side and curtain airbags, at least in the top-spec variant. Standard safety kit includes dual airbags, anti-lock brakes with EBD and all-round disc brakes. Notably, the Marazzo scored a 4-star safety rating in the GlobalNCAP crash test. For the time being, you get a single 1.5-litre diesel engine with the Marazzo. This engine makes 123PS of power and 300Nm of torque and is paired with a 6-speed manual transmission. There’s no petrol-powered Marazzo yet, neither do you get the choice of an automatic gearbox. But Mahindra has confirmed both will be made available by 2020. In our road test, the Marazzo returned 14.86kmpl in the city and 16.97kmpl on the highway. As expected, it isn’t a particularly quick car, taking a leisurely 15 seconds to reach 100kmph from a standstill. The Mahindra Marazzo variants lineup includes the M2, M4, M6 and M8. With the M2, you get a sour deal: there’s no music system, reverse parking sensors or electric ORVMs. This variant makes sense only if you’re looking to add the Marazzo to your fleet of taxis. If you’re looking to buy for yourself and are on a budget, stretch for the M4 at the least. While this variant too isn’t particularly well-equipped it at least gets a music system, rear wash-wipe, rear defogger, a height-adjustable driver’s seat and electrically-adjustable ORVMs. With the M6, Mahindra is throwing in quite a lot of goodies. In isolation, it seems like a value offering. But compare the price premium to the M4 and you’d think twice before justifying that expense. It gets 16-inch alloy wheels, projector headlamps, a 4.2-inch TFT display in the instrument cluster, and a touchscreen infotainment system paired with a 6-speaker music system. In the top-spec M8 variant, you get bigger 17-inch alloy wheels, a better touchscreen with Android Auto and Apple CarPlay, automatic climate control, cruise control and leatherette upholstery. Honda BR-V: Honda's offering in the segment is essentially a jacked up Mobilio with some mechanical changes to compensate for the raised stance. It is one of the only crossovers here that can seat seven people. Renault Lodgy: Renault Lodgy: Renault's only 7-seater in India, the Lodgy is known for being spacious and practical. The sensible choice then? Maruti Suzuki Ertiga: In its new avatar, the Ertiga isn’t really doing anything substantially different compared to the old version. But it does everything a little bit better. And that was all that was required, wasn’t it? Why fix it if it ain’t broke? Toyota Innova Crysta: The Crysta has been a beacon of reliability. It scores well across all parameters, from design to engine refinement to the comfort of the passengers. You also get a bevy of features and the after-sales service is unparalleled too. No wonder people still prefer this luxurious people carrier to big and cumbersome SUVs. The Mahindra Marazzo is a great overall package especially at the price it has been launched at. It offers ample space for seven, offers a premium-looking cabin and comes with an impressive features list with a lot of essentials offered as standard. It’s among the few Mahindras we recommend without hesitating!